Valletta inside forward Carmelo Cristiano was the best club product of his era. In 1914-15, he scored vital goals which gave Valletta the championship and Cousis Shield double. In 1914-15, the Malta FA introduced a new cup competition equivalent of the present day FA Trophy - the Cousis Shield. The draw for the first round brought together newly-crowned league champions Valletta United and Msida Rangers while Sliema Wanderers were paired with Vittoriosa Rovers. Both Valletta and Sliema had easy passages into the semi-finals. Valletta beat the Rangers 4-0 with goals from their exciting young forward Carmelo Cristiano. He scored a double with the other goals coming from 'Floriana imports' Jack Herbert and Salvu Samuel. Cristiano was one of the great stars of the Mile End era. A classic inside forward, he could dribble and shoot with both feet. The future looked bright for the youngster in 1914 but the gods deemed otherwise. In the summer of 1922, football enthusiasts all over the island, especially those from Valletta, were shocked to learn of his untimely death at the tender age of 26. Maltese football had lost one of its brightest stars. In the Cousis Shield, the Wanderers had an even easier time against Vittoriosa Rovers. The Blues won a game of a sort by five goals to nil. Powell and Harrison each scored a double, the other goal coming from Frankie Busuttil. Ħamrun Spartans and Cot-tonera FC were awarded a bye in the quarter-finals. The semi-final between Valletta United and Ħamrun Spartans was the highlight of the competition. It was a pity that the two rivals did not meet in the final. The game was played on April 3, 1915 in front of a packed Mile End Sports Ground. The Spartans kicked off against the wind but they were the first to attack. Valletta, however, were soon to reply and throughout the first half they attacked the Spartans' fort relentlessly. Ħamrun held on by the skin of their teeth until 10 minutes from half-time when Jack Holland burst through the last line of defence before passing the ball to Vella on the right-wing. The latter took the ball to the by-line and centred perfectly into the danger zone. Holland met the ball and from close range he beat goalkeeper Borg to give Valletta a 1-0 lead. During the second period, Valletta dropped back in their own half to defend their slender lead, allowing the Spartans to take the initiative. Ħamrun heaved and puffed but the Whites held fast and at the end the Spartans had nothing to show for their efforts. In the other semi-final, Sliema found it much easier than they did in the league to beat Cottonera United 4-0 for a place in the final. The final was played on May 2, 1915. This was Sliema's first-ever appearance in a cup final. Valletta, however, were finalists in 1910-11 when they were beaten by Floriana at the National Ground final. There was a festive spirit at the Mile End as both sets of supporters settled down for a first-class tussle and they were not disappointed. The game was balanced and both teams had their moments but although the contest was tough and exciting at the end of the 90 minutes both goals were still intact. Everyone expected to see the extra half-hour. However, it seems that before the final both teams had agreed that in the case of a draw no extra-time would be played and that the game would be replayed the following Sunday. This decision, of course, angered the crowd as they expected to have the money's worth in full but at the same time it helped to rise the expectations for the next match. The replay, however, could have been avoided if Sliema did not waste a golden opportunity to win the game. With less than 15 minutes left, they were awarded a penalty. Camilleri presented himself for the spot-kick but to his horror and that of the Sliema supporters Pawlu Bartolo flew across goal to save a shot which would have beaten any other goalkeeper. The referee for the Cousis Shield final was Floriana's long-standing secretary Alfred Victor Camilleri. 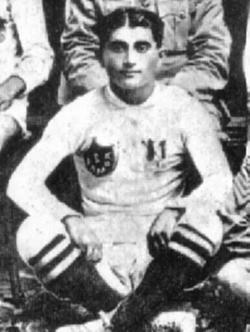 Camilleri was one of the very first Maltese to control football matches. Because of the pique which existed between the clubs, competitive matches were always controlled by British Servicemen. It was inconcievable for a Maltese to be entrusted with this task. The fact that Camilleri was chosen to referee such an important game speaks volumes about his integrity. Sliema paid heavily for the missed penalty. The replay was another close game but Valletta won the Shield thanks to another penalty, scored by the super star of that Valletta team Cristiano.